Remember when you played Zork with a room full of friends watching and telling you what to do? That is the experience that Group Zork aims to duplicate - except with online friends watching the game you are playing and chatting with you and others at the same time. After a long day at work, you decide that it's time for a little R&R with your Commodore 64. You head into your man cave, pop in a cassette of Def Leppard's Photograph song and push play. You turn on the switch of your power distribution center and fire up your Commodore gear. As the 1701 monitor starts to warm up and casts its cool glow upon your face, you wonder what you are going to play. Then you spot your new Group Zork disk sitting there and wonder what it's all about. You pop the disk into your 1541 disk drive, type LOAD "*",8,1 and then type RUN. When you are prompted, you enter your CommodoreServer login and PIN. After signing in, you are suddenly taken to a place where others have gathered, ready to watch your every move. What is this? You discover that you are in a game room on CommodoreServer.com and see others in the room, chatting away. Carl E. from Chicago just finished starting up his Group Zork .d64 in VICE. He signs in and also enters the same game room. Suddenly, CARL-E ENTERED THE ROOM appears on your screen. Is this your childhood Commodore friend from long ago? You start chatting with him and recall all of the crazy programs you used to write and games you used to play, like Zork. You agree to start a new game and he can watch, just like old times. As you make your way from the white house to the deep, dark catacombs, across the reservoir dam, into the volcano, your game achievements start to attract others who join in and watch your progress. Carl makes his suggestions as you both work through the puzzles, but others have their own opinions that they share with you. Oh, yes! This is just like it used to be. You play late into the night and before you know it, realize that it's now 3:30 a.m. (just like it used to be) and you have an early morning meeting. Too bad you don't sill live at home - your mom would've checked on you a lot earlier and made you go to bed. Oh, well, no problem. You can save your game and come back to it later. Welcome to Group Zork - the game that re-creates your childhood experience, just the way you remember it (but without your mom nagging you). 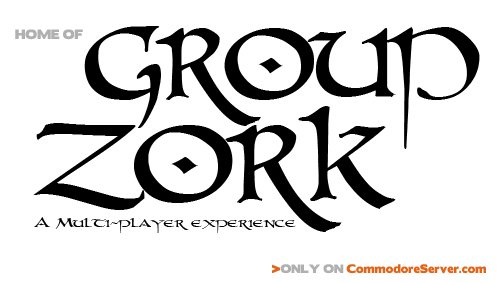 Group Zork is the first multi-player game to take advantage of CommodoreServer's gaming service and provides an online game experience like none other. For more information, please see the article Overview of CommodoreServer's Multi-Player Gaming Service. There are two ways you can play Group Zork now. But first, you must create an account on CommodoreServer since it uses the gaming service to communicate. After you sign in to CommodoreServer, you are taken to the 'My Account' section where you can adjust your account settings. Look for the section 'Remote Login' - be sure to set this according to how you wish to log in from your C64. Next, make sure you know your 'Remote Access PIN', or just set it now - this is different than your password on the Web site. It allows easier access to your account from a C64 and protects the password for your account. Before using VICE, you must configure VICE to simulate a Comet64 Internet Modem (i.e. make it work on the RS-232 port). If you have WinVICE 2.2 or higher, you can follow this procedure to use V-1541 in VICE, without the need for any special hardware. Once you have VICE configured and have verified that your connection works, download the Group Zork.d64 disk file from the Public Disk Games Folder. Attach the disk in VICE and type LOAD"VICEBOOT",8 and type RUN. Both V-1541 and Group Zork will begin loading immediately and the game will start automatically. Now skip to the Login Instructions below. Run the program - Type LOAD"*",2 and then RUN. Group Zork will download all necessary files in order to play from a real Commodore 64! After running the Group Zork program, you will be prompted to log in. Please use the login method you chose under 'My Account' on the Web site (whether you use your screen name or your email address) and press RETURN. You will then be prompted for your PIN - do not type your password from the Web site. Use your Remote Access PIN, as specified above and then press RETURN. You will be taken to a chat room initially where you can meet up with friends or just chat. The Group Zork menu can be displayed at any time by pressing F7 or RETURN. To chat to the room, press 1. To start a game, press 4. To watch a game, press 5. When playing a game of Zork, use option 2 to talk to the Zork server. You can also talk to just people watching your game by using option 3 (or option 1 to chat to the entire room, just like before). Enjoy! Let us know what you think and if you have any comments or suggestions. recieved: ?500 - deprecated csip command. please use newgame instead. You are using an older version of Group Zork. It's always a good idea to load the version from the V-1541 disk directly over the Internet. That way, you'll always be using the most recent.